Last year Dapper Day saw 3,000 – 4,000 participants in Disneyland alone. Judging by the popularity, we believe it is destined to get bigger every year. So what is Dapper Day and what does it all mean for you and your visit to Disney Parks? Let me start by saying that Dapper Day is NOT a Disney sponsored event. It is completely optional and perfectly OK to stay casual or not even participate at all. Again, it is certainly NOT official, and purely optional and fun. How did the event come about? Organizer Justin Jorgensen is said to have been inspired by the original Imagineer Illustrations of Disney Park designs and even more recent concept art for Epcot. These images often portray guests dressed as though they are going out for a very upscale event such as an opera or a maybe a high-end restaurant. Why shouldn’t going to Disney still be on par with such grand affairs? Well, that is what Dapper Day is all about. It is a chance to realize those designer’s dreams. On Dapper Day, you bring those illustrations to life when you become those well dressed guests the designers imagined (or hoped) would be filling the park. Stay tuned to Disneyways for more on Dapper Day, including ideas for what to wear, videos from last year, event hours and suggested schedules. Each event usually has a simple schedule of one or two in-park gatherings like the evening “Dapper Derby” at the Fantasyland carrousel in Disneyland. However you and your party are encouraged to enjoy the park at your leisure. So what are your thoughts? 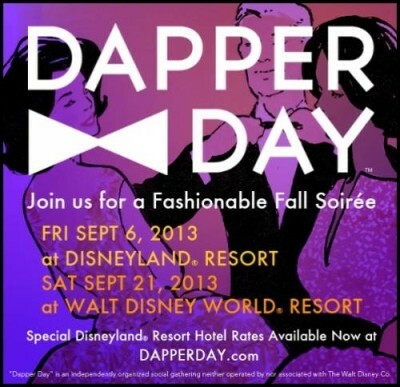 What do you think of the idea of Dapper Day and will you be participating? Hot news from Disney for the week of December 8th to 15th 2012! Here you will find some of the hottest Disney news from all around the web, as well as some fun stuff from Disneyways. We hope you enjoy getting it all right here in one place! Top 5 Things You Won’t Want to Miss in New Fantasyland. Ooh la la! Bistro de Paris Gets a New Name! Monsier Paul made it’s offical debut on December 11th. We responded to questions and rumors with our post Solving the Mystery surrounding the Rapunzel Tower in New Fantasyland on December 13th. We shared New Year’s Eve events back in October but details from around the web were all the buzz this week too! Just to mix it up a bit for you, we posted awesome videos and historical information about Living with the Land, as well as some current information about the “Behind the Seeds” Tour you can enjoy there. December 15th we shared Christmas decoration photos from inside the attraction that were taken just this week! We hope it makes you feel like you were actually there with us. Finally, we want to share a link to the official news from Disney about Comedy Warehouse returning for the holidays! That about does it for this week! Stay tuned, because coming in just a few days, we will have details about the new Splitsville and lots of other fun surprises to share. We want to hear YOUR Disney hot news! Please share your thoughts, comments and stories in the comments section below OR contact us directly! Ooh La La! Bistro de Paris Gets a New Name! Bistro de Paris will soon have a new name, Monsieur Paul. The restaurant has been closed since July 2012, and the new name has been spotted on the most recent Epcot guide maps. “Monsieur Paul” is in reference to Paul Bocuse, one of the three chefs who started the restaurant. 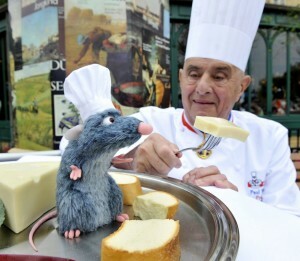 Not one to steal anyone’s thunder…as of right now… Remy is only making appearances at Chefs de France. I think he and Chef Paul are friends however. Here is some photographic proof. Chef Paul has been named Top Chef of the 20th Century by the Culinary Institute of America. He is also considered to be the first “celebrity chef,” because he put his name on his own restaurant way back in 1965. The newly re-named Bistro in Epcot (Monsieur Paul) is expected to re-open in early December 2012. Before the Bistro closed, it was a little known fact that you can see Illuminations (Epcot’s fireworks) while dining there. The second floor view was said to be awesome – as long as you requested (and got) a window seat. If you’ve eaten there I hope you’ll share your experiences. Hopefully one day soon I will make it to Monsieur Paul.